Spring is my second favorite time of year. Sometimes it passes by too quickly though! For this card, I am using Hero Arts Color Layering Birds and Blossoms. I picked up this cute little set of dies and stamps at our Stamp & Scrapbook Expo in Anaheim, CA. If you have never been to an SSBExpo you have got to go! If you love to shop and crop this is the place to be! My friend and I are now impatient for the next expo in Califonia which comes in October. That will be in Ontario and since we normally attend 2 Expos each year here in California we look forward to each one! Find an expo in your area by checking out their site here. This set that I picked up came with the cutting dies and a set of 4 Hero Arts stamp cubes. It was a nice little bundle! Thanks, Bee Creative for stocking these and selling them at the SSBExpo! I gave this little card to a co-worker today in celebration of Administrative Professionals Day. I gave this little card to a co-worker today in celebration of Administrative Professionals Day. She loves birds and I thought it would be a hit! 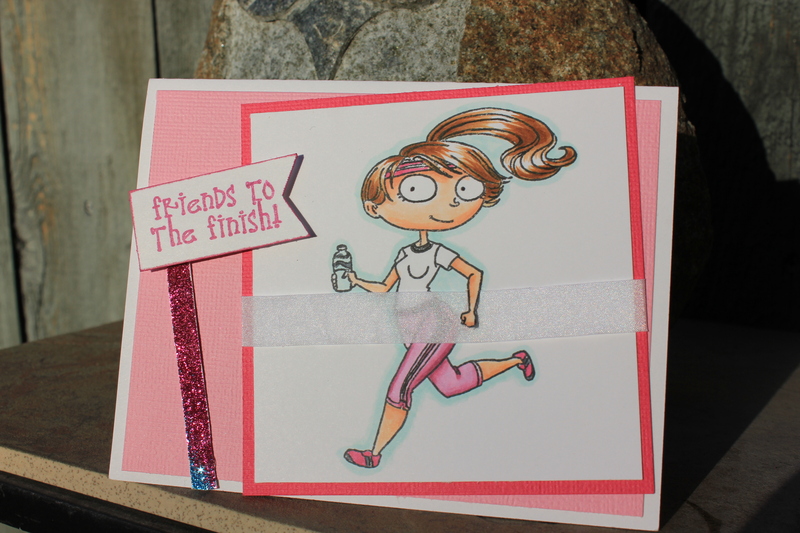 I am entering this in the April “Anything Goes” challenge at A Blog Named Hero with Hero Arts. Top photo was taken in the sun & bottom photo in the shade. I was at the my favorite neighborhood coffee shop Coffee Connection when these were taken so I used the backdrops that were available. I just love this coffee shop. The staff are so friendly and the owners are awesome! 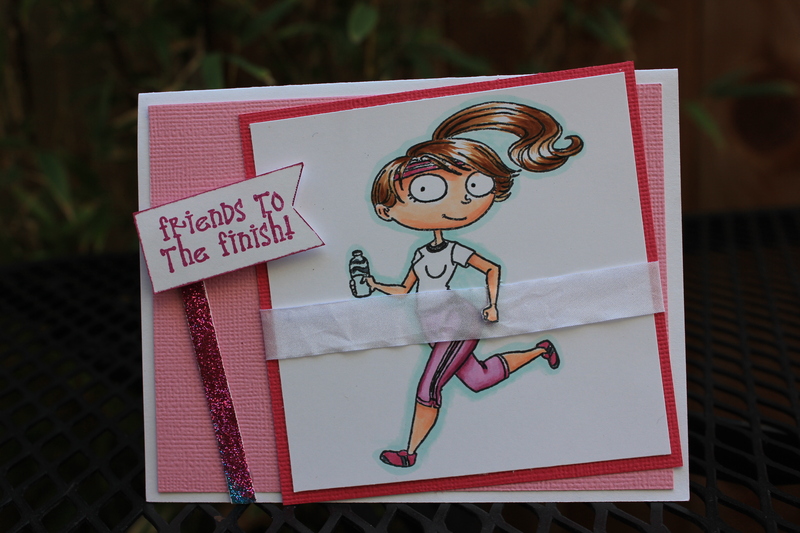 I cut the runners arm up to about the elbow so that I could put it on top of the ribbon to look like she was crossing the finish line at the end of her race! The sign post was glittered up using my favorite glitter from Sparkle and Sprinkle. I love being creative and sharing my passions with others. Whether its coloring with my Copic markers, making crafts or helping those in need, I attempt to bring joy into others lives. I feel so blessed in this life that God has given me, the best way that I can show my gratitude, is to help others who God puts in my path. I hope that others can see my savior Jesus in the life i live out each day. I have been blessed so that others can be blessed. Sizzix & Scrapbook.com Big $2500 Giveaway! Thanks for today Natalie Rogers. You are a hair magician!